I haven't posted a Tot School post for the several weeks. We were busy with Easter and traveling. But we did continue our alphabet adventures and studied the letter "e" the past couple weeks. We've focused on eggs, elephants, the earth, elves, and engines. "The Word of the Lord Endures Forever" 1 Peter 1:25. We printed out the memory verse from the Totally Tots printable. This is really hit or miss at this point. Sometimes Jonathan will sing along with the song, and sometimes not. I don't know that he's really capable of memorizing verses at this point. But it's still something I want to attempt with him. 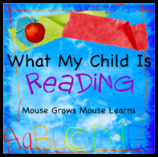 Have any other moms had success with memory work at this age? We also read through a little devotional in the morning, Everything a Child Should Know about God by Kenneth Taylor. We do one page each day and talk about the pictures. What has been the biggest hit was an idea my husband came up with. We had been trying to read Jonathan from a toddler Bible, but found that the stories are often truncated with one story per page. He wasn't paying attention well or engaging in the story. Brian thought maybe if we had a separate children's book for each Bible story, he would engage more. We bought a few books from the Beginner's Bible I Can Read and Jonathan loves these books. Each night he asks for one or more stories and he remembers the basic plot of the stories. He's started telling me that Noah was happy because he loved God and that the mean king of Egypt said "No! No! No!". It's really quite cute. The stories in this series are retellings of the Bible stories, so they are not the actual text of Scripture itself. Our hope is that by reading these at night, we'll be able to transition more easily into an actual children's Bible. We read lots and lots of books the past couple weeks about all of our "e" words. Here were some of Jonathan's favorites- click on the links to see our full reviews and lots more books! Eddie The Elephant's Exciting Egg Sitting by Barbara deRubertis - a cute book about an elephant who "egg-sits" for an emu. It introduces several "e" words. Our Big Home: An Earth Poem by Linda Glasser A beautiful book that celebrates the earth that all people and creatures share. The detailed illustrations provide plenty of fun! Round Like a Ball by Lisa Campbell Ernst A fun guessing game about what is round like a ball. Beautiful die-cut pages get larger and larger with each clue until the object (the earth) is revealed. Guess What is Growing Inside of this Egg by Mia Posada- another guessing game showing that not just chickens hatch from eggs. The Little Engine That Could by Wally Piper - the classic children's tale! And those are just the highlights of the books we read the past couple of weeks! We also read books by Gene Baer and Keith Baker as part of our Reading Our Library project. Jonathan has really been enjoying this series. Each letter is represented by a little boy or girl who finds objects that begin with his letter sound and put them into a box. He requested this book several times and it gave us chances to talk about words that we aren't covering as part of our "e" unit such as envelope, Eskimo, and eggplant. We were reading the "E F Book" this week. Jonathan has liked this series as well, but not as much as the sound box books. We did some work on lacing using cards (eggs and elephants) I printed from Confessions of a Homeschooler and 1+1+1=1's Tot School Printables. Jonathan wasn't so interested in the lacing this time though. He has been really focused on gross motor skills. Lately he's becoming quite the little boy- very, very active. Everything is a baseball bat or a hammer to him. We've been trying to set boundaries over kicking balls in the house. It's a little of a struggle for me because I don't want to squash the little boy in him, but yet the constant activity drives me nuts sometimes! Anyone else deal with this? We did some pre-writing exercises from our Tot School Printables pack. Jonathan's getting better at making lines and circles on a page. However, he gets so excited that then he wants to scribble all over the page! We played with Jonathan's Thomas the Tank Engines a lot. He loves these! We practiced number matching/counting by using an Easter egg printable from Confessions of a Homeschooler. This one was hard because the eggs were printed on the page and Jonathan had a hard time knowing which eggs he counted already. We practiced more counting using another printable from Love My Life x 4. This one was easier for him because he had to move eggs into a basket. So he knew which eggs he had counted already. Well this stormy weather put a stop to it for a bit again, so this time I said, put on your rain boots and go! hahaha!!! Wow! You sure had a busy and fun week! 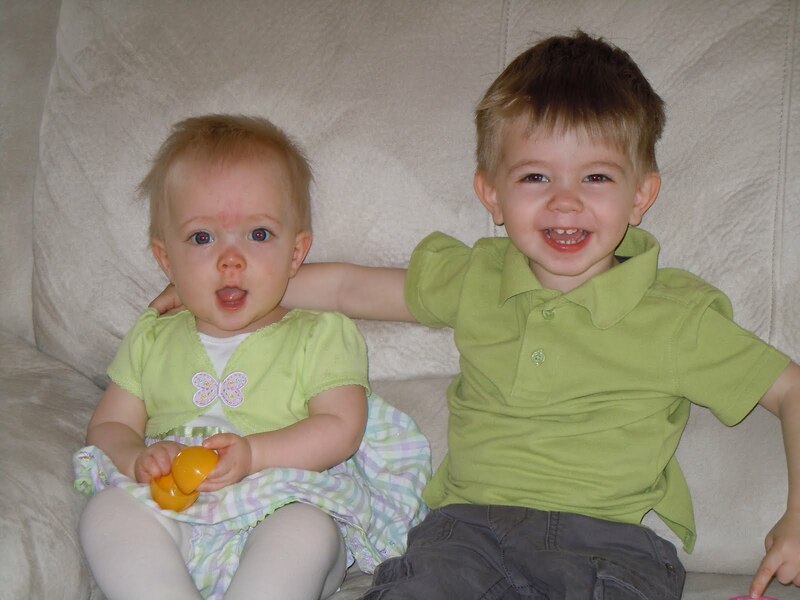 Your children are so adorable!! 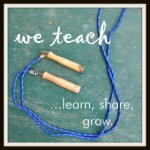 Visiting you from the Tot School blog list! We'll have to make that elephant since we are reading about elephants this week! Also, I've been looking for good Bible story books like you described. I'll have to check it out! Thanks for joining WMCIR! The "guessing books" you mentioned sound very interesting, especially by Mia Posada. We just read another of her books. I'll be looking for the Egg book! Those are awesome! I was going to start the letters with Marlee this year, but think I am going to wait til the fall to do it with her. But I am def. going to use some of your ideas! How fun! I also love the manipulatives to count with! We do that sometimes too! 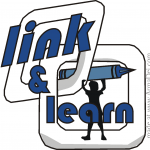 Catching up on neglected links! 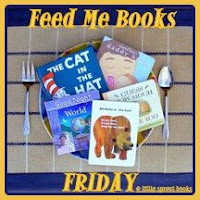 Thanks for linking up at Feed Me Books Friday! So glad I finally made it to your post - your devotional and bible story books sound so good, and the letter sounds book has me intrigued too!